Maintaining continued growth and leadership in the evolving children’s application market requires maximizing the value of our products to serve parents and children. In this paper, we discuss how infusing Common Core State Standards into our apps/games and conducting our business in a socially responsible manner contributes to building trust among our target purchasers and to our future success. To demonstrate how Cupcake Digital is maximizing its potential for leadership in the children’s app market by infusing its apps with educator-developed learning moments specifically aligned with Common Core State Standards (CCSS). The Common Core State Standards will play a critical role in the education of America’s children going forward. The Common Core State Standards Initiative is a state-led effort — developed in collaboration with teachers, school administrators and experts – to provide a consistent framework that will help ensure children are college and career-ready by the end of high school. The CCSS set the requirements for children K-12 in all academic subjects and provide teachers and parents with a common understanding of what students are expected to learn. However, as the introduction of the Common Core State Standards is in its earliest stages, communication to parents about this new concept and what is means to their children’s education is not yet clear or sufficient. Cupcake Digital is committed to being a thoughtful, socially responsible company that parents, caregivers and educators can trust. We believe that producing apps that not only entertain, but also help ready a child to meet nationally acknowledged academic requirements can only enhance our own potential for success. The apps and games we produce are based on well-known, highly successful children’s entertainment media properties. These delightful stories are adapted in the form of deluxe storybook experiences and interactive games. The infusion of learning moments — aligned with Common Core State Standards – enables us to maximize the educational value of our apps and games. Cupcake Digital has taken a leadership role in the curriculum-infused children’s app market by creating free, educator-developed worksheets and activities that supplement learning moments in the story. While 47 states have committed to adopting the Common Core Curriculum by 2014, awareness of the initiative’s specifics and value is not yet widespread. 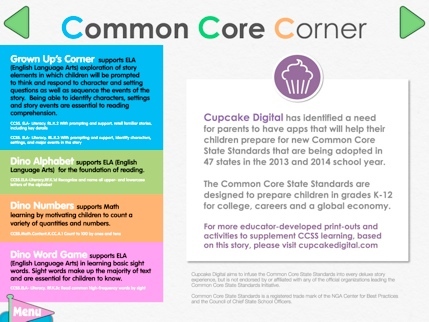 Cupcake Digital has identified a clear opportunity to help inform parents about the Common Core State Standards – in layman’s terms – in the Common Core Corner at the end of each app. It is intended to help parents understand how the app is preparing their children to meet the CCSS challenges at school and what their children are learning through the app’s activities and the process of reading the app itself. “Digital media offers children unparalleled opportunities to learn, imagine, participate, practice, and create. But without a guidepost, we know parents, educators, and kids have difficulty finding engaging, enriching interactive experiences,” said Susan Crown, founder and chairman of SCE. Cupcake Digital is one of the first companies in the children’s digital space to blend entertainment with Common Core State Standards learning moments, and we do so responsibly. “The process of infusing our apps with CCSS was not one we approached lightly,” says Susan Miller, President and Co-founder of Cupcake Digital. “To align our learning moments effectively with Common Core requirements, we looked to educational consultants — experts in the Common Core State Standards – to work with us,” she continues. An example of how CCSS-aligned learning moments are infused into Cupcake’s apps is attached. (link to examples provided at the end of this position paper) The example shown addresses the infusion of English language arts and mathematics activities in Wubbzy’s Dinosaur Adventure. Cupcake is dedicated to the notion that there is room for fun in learning. While our apps are infused with the CCSS, we make the learning process entertaining and thoroughly enjoyable! Cupcake Digital is one of the first companies in the children’s digital space to recognize the opportunity to serve parents and children better by maximizing the value of our products through the infusion of Common Core State Standards learning moments. In so doing, we are also striving to help make CCSS easy to understand and easy to practice for parents and kids. “As the children’s digital market floods with new products at exponential rates, parents will need guidance in choosing the highest quality products for their kids,” says Brad Powers, Chairman and CEO of Cupcake Digital. The Common Core State Standards are here to stay; and national awareness of them will increase over the next two years. Cupcake Digital’s authority on the subject of CCSS and accountability for responsible infusion of the standards into our apps will continue to provide us a strong competitive edge. Three games in Wubbzy’s Dinosaur Adventure are specifically designed to help prepare children to meet the requirements set forth for Kindergarten by the CCSS. The games illustrate how Cupcake Digital blends entertainment and learning in games that are fun and fanciful, while also instructive. Children are asked to drag the dinosaur over the trees to eat all the letters. As the letters are eaten, the letter name is spoken by the narrator so that children can make the association. 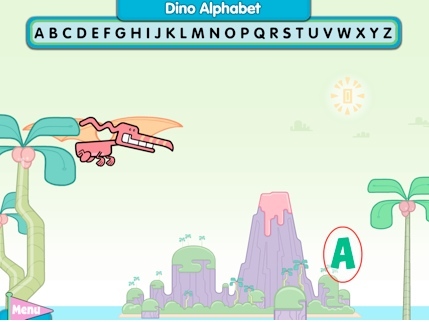 The Dino Alphabet Game supports the English Language Arts CCSS for the foundation of reading, which require children to recognize and name all upper- and lowercase letters of the alphabet. Children are asked to help the dinosaur to eat all the numbers from one to 10. The numbers are read aloud, so that children can learn to recognize them. 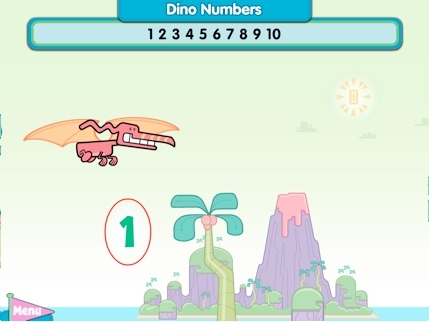 The Dino Numbers Game supports math learning by motivating children to count a variety of quantities and numbers. CCSS requires children to be able to count to 100 by ones and by tens. Children are asked to help the hungry dinosaur find some words to snack on. A word appears at the top of the screen and is read aloud. Below the word is a list of three words. The child must select the one that matches the word at the top of the screen. 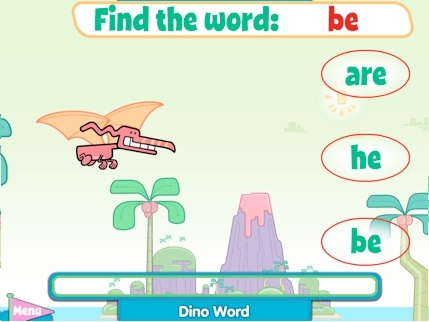 Dino Word Game supports the English Language Arts CCSS requirement for children by teaching them to recognize a list of basic sight words that make up the majority of text and are critical to reading. Cupcake Digital, Inc. was established in June 2012 with the intent of transforming children’s entertainment properties into deluxe story experiences infused with educational moments. Its first venture into digital applications was based on the Emmy Award-winning television series “Wow! Wow! Wubbzy!” The app immediately rose to # 1 and # 3 among children’s book apps on Amazon and iTunes respectively. Since then, every subsequent children’s story app created by Cupcake Digital has achieved a top 10 rating on Amazon. Headquartered in NYC, Cupcake Digital was founded by proven professionals in the fields of technology, family entertainment, publishing and brand marketing. 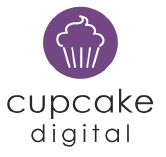 In October of 2012, Cupcake Digital received its first round of private funding and has since gone on to partner with additional major children’s entertainment properties. For more information about Cupcake Digital Inc., please contact Carmen Hernandez at pr@cupcakedigital.com or visit www.cupcakedigital.com.